Recently, I was trying to dream up something to make for the 4th of July … I was frustrated … my brain wasn’t working, again! The flag could be served just the way it is or maybe to decorate the top of a cake, Rice Kripsie Treats, brownies, etc. This project also gave me the opportunity to use CandiQuik for the first time. (Miss CandiQuik was so kind to send me some a few weeks ago.) 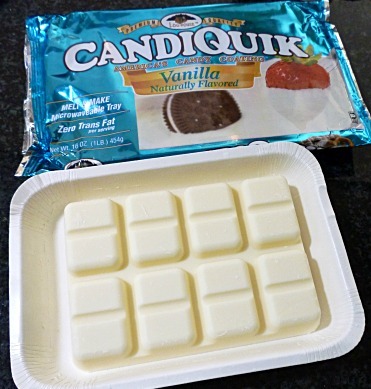 I was very pleased with the Vanilla CandiQuik, it has a nice flavor, was easy to melt and comes in its own melting tray … perfect for dipping licorice! Work on prepared tray. Mark 7 pieces of licorice at 3-1/2″ (each licorice piece is about 8″ long). 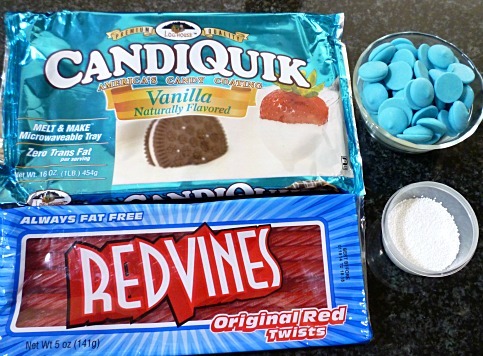 This is a guide for dipping the blue candy. 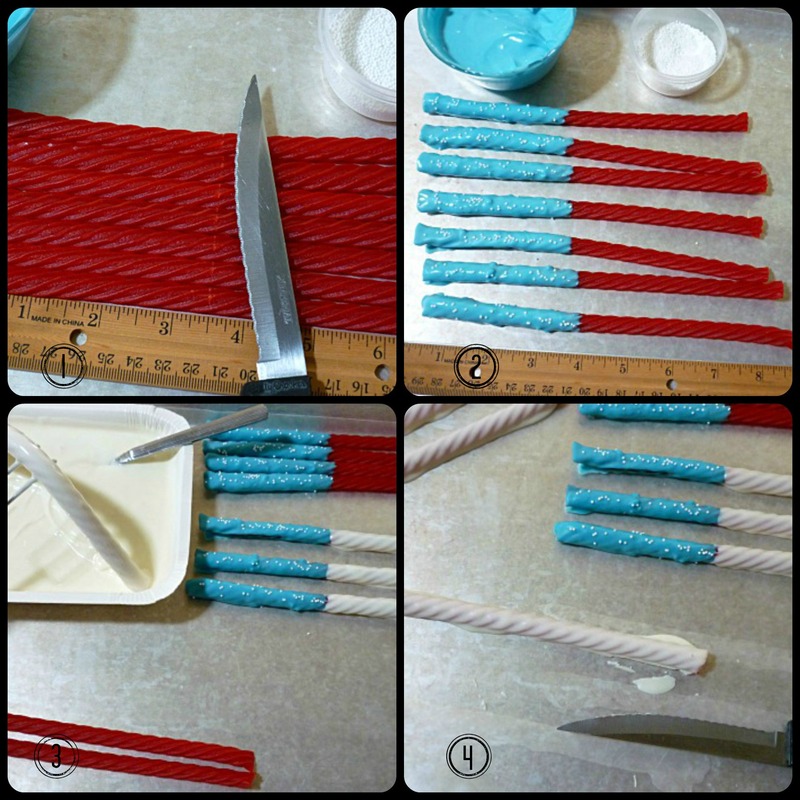 Dip the licorice in melted blue candy, shake off excess candy, lay on prepared tray, add a few white sprinkles, chill for a few minutes. Take 3 of the blue dipped pieces of licorice and dip in white candy, tap off excess, lay on tray, chill. Dip 3 pieces of plain licorice in white candy, tap off excess, chill. I look forward to your comments ! 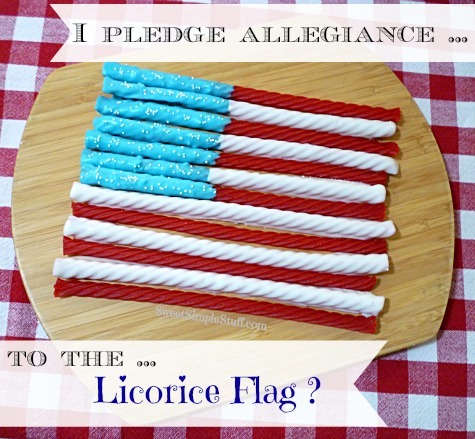 Love this sweet idea for 4th of July! This is really cute. And since a lot of kids like the licorice this will go over big! Who ate the leftover Vanilla CandiQuik, Brenda? This is really a super idea. Thank you Kathleen 😉 The CandiQuik is hidden and saved for another project! So creative and cute!! Love this project! I absolutely love using the CandiQuik. Remove from package, pop in microwave and in no time it’s all melted in it’s very own tray…….. easy peasy. I’m not all that fond of licorice so thought I would try using the pretzel rods and sprinkle on the candy star sprinkles. Thanks for sharing your creative talent and inspiration with us.. Almost 2am here so guess I better go get something done around here. Bedding all washed so off to do something else. Regarding pretzels … that is what I originally thought about using! I decided to use the red licorice and because it was simpler. P.S. Try to get some sleep! Really cute idea. Looks so American. Love it. This is a great idea! Love! LOVE it! Sharing on our facebook page now :). Thanks! The licorice is a good idea because the red stripes are already done! Thank you Sarah 😉 My thoughts exactly on the licorice! Hi, this is a perfect idea for my son’s graduation party favors. He will be going to the Marines after his party and his theme is Marines, and these would go along with his theme. How long in advance can I prepare them so it won’t be stale.